Have you ever wanted to try your Ninja or LeapFrog skills? Our classic Leaps & Bounds is now available in a 3-ball model if you’re looking for a lightweight unit or need a smaller footprint for an FEC. 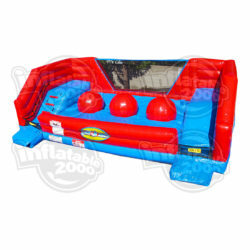 This game features a series of three giant inflatable balls which challengers must run or leap across from ball to ball like a frog to the other side! But don’t worry if you fall off, this floor of the pit protected by our super-soft Zero Shock landing mattress. Dimensions: 30′ x 15′ (plus ramp) x 10′, Weight: 697 lbs.